Students at the University of Minnesota are getting a feel for what could be the classroom of the future. 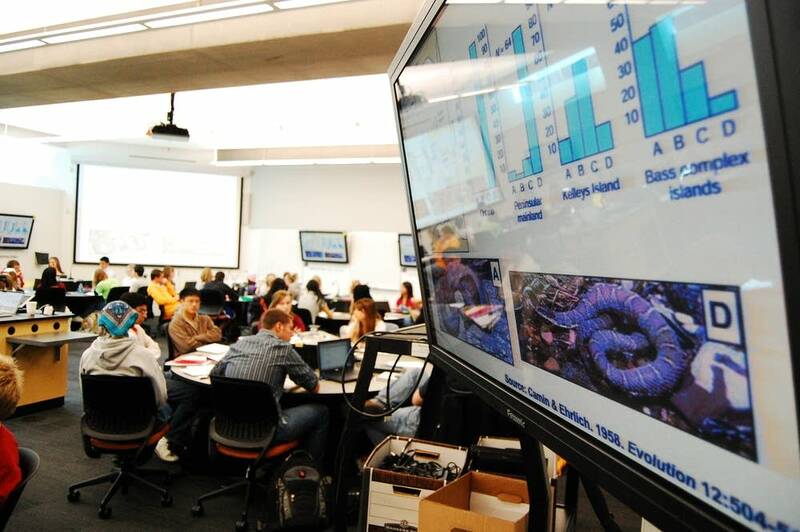 The brand new Science Teaching building on the university's Minneapolis campus is to home 17 active learning classrooms, more than any other college in the country. The high tech spaces are an alternative to the lecture hall, and instructors say the new classrooms help them teach more effectively. Biology 2002, an introductory science course at the University of Minnesota, starts with what sounds like a standard lecture on evolution. "So here are the assumptions of the Harvey-Weinberg equation," professor Mark Decker says. But this isn't a typical lecture. Decker isn't at the front of some echoing lecture hall, preaching to a sea of sleepy students. Decker is working the room like a motivational speaker at a conference, wireless mic and all. He walks among the class's 120 students who are seated at round tables in groups of nine. The arrangement is more dinner party than biology lecture. "Did I mention that these are water snakes? I don't think I mentioned that. So what are water snakes really good at?" he says. Each table is outfitted with a flat screen monitor, so students have a close up view of those water snakes. And don't expect to see raised hands in this classroom. Students get the instructor's attention by grabbing a microphone at their table, broadcasting their voice to the entire room. After about 20 minutes, the lecture is over. That seems rather brief for a two-hour class, but it's by design. Research shows students learn best when lectures are short. Students spend the rest of the class working on group projects at their tables. As the noise in the room increases, professor Decker says the active learning classroom's strength is in its ability to bring students together. "As we can tell in the room right now, everybody is talking to everybody else. Everybody is engaged in what's going on. So it's exactly what should be happening," he says. At one table, students edit a document, their work shows up on a nearby flat screen monitor. Yusuf Agamawi said he likes the hands on nature of this classroom. "Other classrooms you just generally sit there and listen to a lecture. In this one you have to do stuff, work as a team, you have to think a lot," he said. 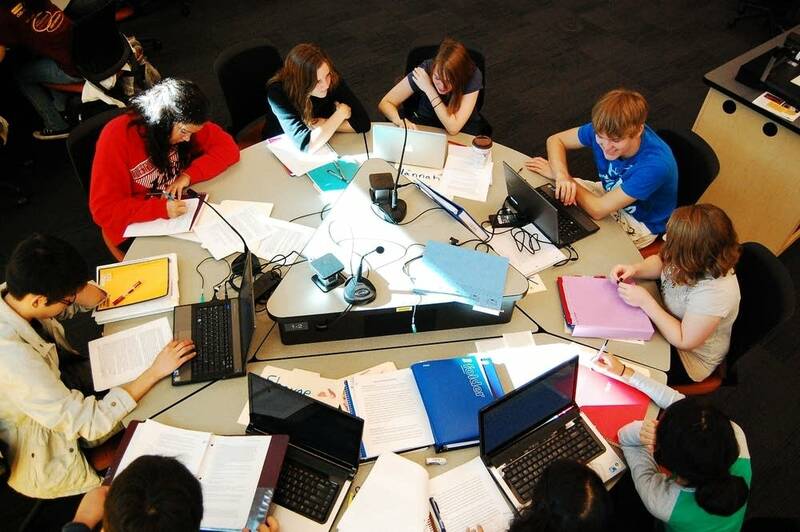 Students working in groups is not a new approach in learning, but it's usually reserved for smaller classes, not one with more than 100 students. Robin Wright is an associate dean in the university's College of Biological Sciences. Wright says a few years ago this course was held in a lecture hall where students could easily blend into the crowd. 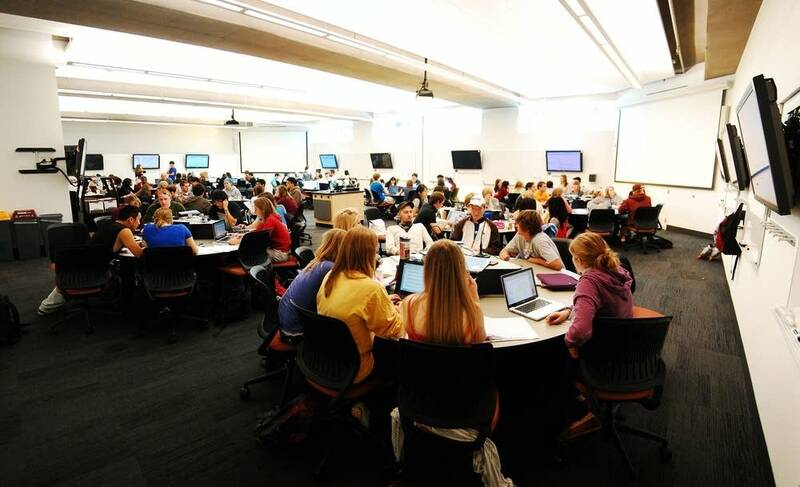 But in an active learning classroom students and instructors are physically much closer. "You can't fall asleep, you can't work on the Sudoku, you can't relax and wait until the night before the exam to do something," Wright said. "It's not necessarily the norm, or what they're used to." And since it's not the norm, some students and some instructors, have had a hard time adjusting to the new classrooms. "Some really like it, some really thought we should use it more, and some said, 'I hated the technology,' and some found it very distracting," Opsal said. Wright isn't surprised the adjustment is tough for some students. After all she says most spent 12 years before college sitting in class, listening to their teacher, and taking multiple choice tests. The university has experimented with a couple of active learning classrooms on its St. Paul campus for a few years. Wright said their data shows that students who take classes in those rooms go on to get better grades in future courses, even if they're held in old fashioned, low tech lecture halls.